We’ve been trying to use our freezer more recently, and so far we’ve got pretty good at freezing leftovers from large weekend meals. What we haven’t done is actually use up anything we’ve frozen… so we’re making an effort this week to use things up before the freezer becomes full. First up we’re going to use the fish chowder I made recently to make a fisherman’s pie. The fish chowder is low cal, and just needs defrosting and topping with mashed potato so this makes for a great weeknight dish. I’ll use the pressure cooker to cook the potatoes which will make things even faster. Couple of problems… firstly with defrosting the chowder. 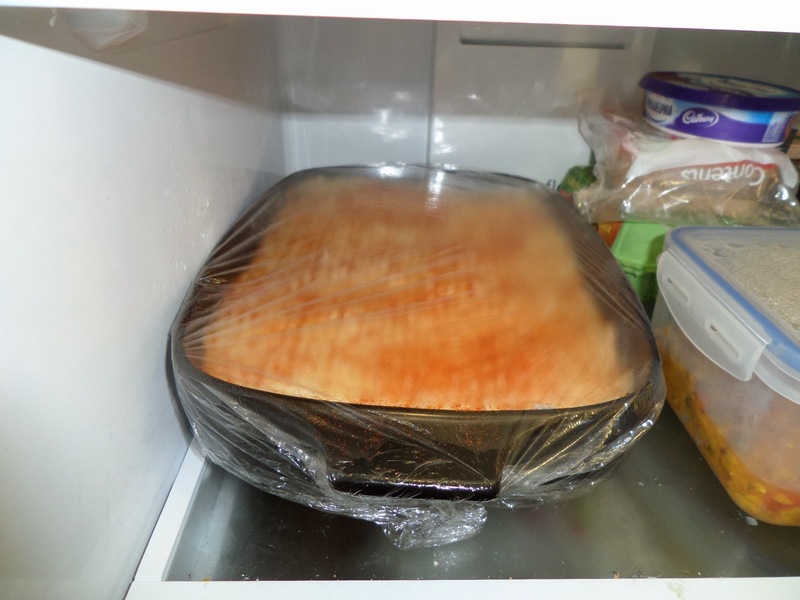 I took it out at 7am and put it in the fridge, and when I got home at 7pm it was still frozen solid. Thankfully 30mins in a warm water bath, and q little microwaving, and it was liquid. I guess in future I’ll leave things out at room temperature to defrost. Then problems with the pressure cooker: it wouldn’t get to pressure. The main seal seems fine, but the auto/manual or on/off thingy just let out water vapour constantly and the middle indicator never went up. After two lots of water got used up they were cooked, but it didn’t save much time over boiling! With those problems overcome I made up the dish. There was more potato in the chowder than I remembered, so it’s going to be a very potatoey pie! I forked the top, so hopefully we’ll get some crispy bits on top, and then sprinkled with paprika. Then it’s into the fridge until we cook it tomorrow. I was home late today, so Soph popped the pie in the oven: 200c fan for about 40mins, and we served it up with peas. 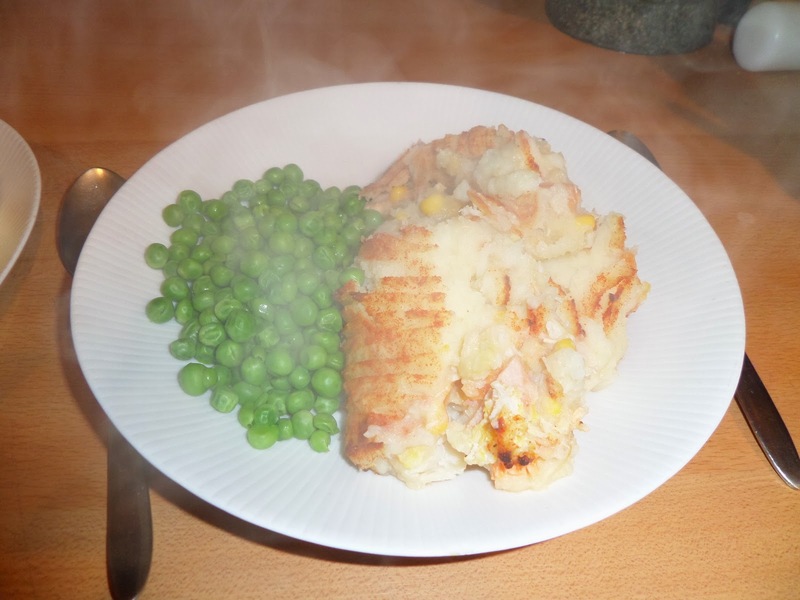 It worked really well: the top was nice and crispy, it tasted great and didn’t seem too potatoey! I suppose I didn’t taste the paprika much, maybe it needed more, or some cayenne added to give it some kick!